Every Nation recently visited the Sanford/Lake Mary Campus of Seminole State College. Imagine traveling to a new land thousands of miles away: a place where your culture, language and even your lifelong friends are virtually nonexistent. Now imagine being a student as well. For Every Nation, a worldwide Christian organization founded in Manila, these feelings of confusion and fear are something it hopes to assuage. 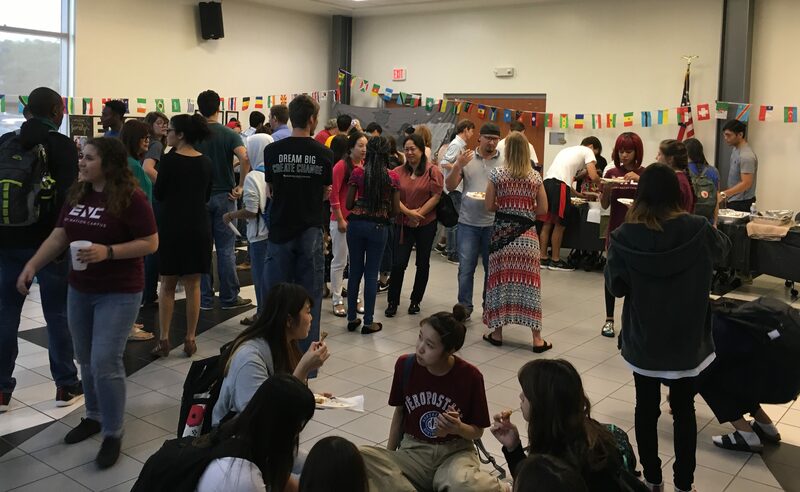 Seeking to bring together the international student community at Seminole State, Every Nation recently hosted an international showcase and “hangout” to “connect with international students,” as student organizer Jennice Hernandez explained. Being their first visit to SSC, members of the campus arm of Every Nation welcomed various students and cultures to the event. Student organizers greeted every visitor at the door and directed them into Automotive Showroom for the showcase. Entering the showroom, a collage of culture and people awaited every visitor. With five continents represented and several countries highlighted, the room resembled a miniature World’s Fair. There was even an extended table brimming with exotic foods, whose smell pervaded the room like a warm embrace. “My country is small, but rich with culture,” said Veronica Ayala, a representative from Ecuador. Dressed in the vibrant yellow soccer jersey of Ecuador’s national team, Veronica used intricately adorned badges to highlight several key cities. She proudly shows the badge for her hometown, Guayaquil. Stamped with color images of animals from the nearby Galapagos Islands, this badge (and the others around it) were like snapshots of Ecuador itself. As the largest city and main port of Ecuador, Veronica said Guayaquil is very “much like Orlando,” but is only a small example what Ecuador has to offer. Suddenly, the room came alive with a game introduced by international student Lisa Ngoie. The game, called Kangé or Nzango, involves two players, precise timing, and rapid movement. Deciding between being an attacker or defender, each side chooses a foot to use to gain points, according to the Daily Mail newspaper. Each side then, following the rhythm of music, then begins to jump with the attacker gaining a point if the position of their feet match and is faster in position to their opponent. Originally from the Democratic Republic of the Congo, Ngoie, who is studying biomedical sciences, said she hopes her teaching of this childhood game can bring together all different kinds of cultures. Watching from the perimeter, Pastor Tom Breckwoldt was smiling from ear to ear. Having organized this event with the campus ministry of Every Nation, Breckwoldt noted how important it was for these students to have a place for them to come together. The pastor joined a group of Japanese students teaching traditional origami technique. Invented in China and brought to the Japanese mainland by monks in the sixth century, origami is a hobby of both passion and recreation according to an article from PBS. Sayuka, a student hoping to teach English to Japanese students in the future, demonstrated the folding of a swan. Moving with the expertise of a master, Sayuka’s fingers flittered across the 3-by-5-inch folding paper with ease. Within two minutes, a perfectly crafted swan floated across the table, much to the praise of Breckwoldt and other students. As the event ended, Stephanie Eiserman, a senior student organizer, said she was pleased with how the day had gone. For students interested in attending international student events run by Every Nation, meetings are held Tuesdays at 2 p.m., Wednesdays at 12:30 p.m. and 2:15 p.m., and Thursdays at 2 p.m. on the Sanford/Lake Mary campus in the Student Center.